Gregory J. Tegarden is a potter from Corpus Christi Texas. He received a Masters of Fine Arts in Ceramics from Texas A&M Corpus Christi, and a Bachelors of Science in Botany from Sul Ross State University. He interned with Daniel Johnston for two summers in 2009 and 2010 where he learned a traditional Thai method of coil throwing large vessels. 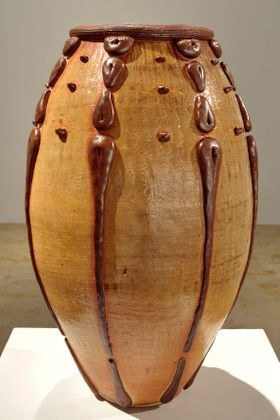 His studio work consists of mostly large vessels that are influenced by plants and the desert southwest. Nature is the fundamental principle in my body of work and my soul is spiritually guided by it. Creatively my pots are derived from the desert, specifically the Big Bend region of the Chihuahuan Desert. The desert, for me, represents the purest form of divinity. This pantheistic viewpoint derives from a personal relationship with the desert’s austere landscape and my pots are a manifestation of it. A desert, like clay, is defined by water. Both record the presence and absence of water. My forms are inspired by the plants in these arid environments, which have evolved as vessels of containment and storage of water. They exemplify the stems and branches of cacti and succulents and allude to the flowers of these plants through altered rims and attachments. The surfaces mimic the landscape of the desert with the soda-fired patinas on top of thick textured slips.